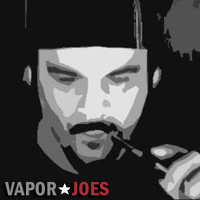 The Council of Vapor Tempest 200W TC Box Mod is the newest flagship device from the critically acclaimed Council of Vapor’s lineup, a fully-featured triple 18650 platform capable of outputting up to 200W, temperature control suite, and beautifully embossed carbon fiber panel with premium zinc and chrome architectural structure. 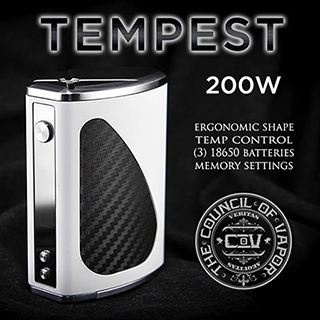 The Tempest 200W utilizes Council of Vapor’s proprietary chip, designed cohesively with the chassis to optimize the triple 18650-battery occupation while maximizing effective button layout and ergonomic handling while maintaining an extremely high level of functionality and performance. The result is a gorgeous output technology in the market, equipped with an output range of 1 to 200W alongside a sophisticated temperature control module and three optional Ramp Mode: ranging from slower ramp speed for mouth-to-lung style to power mode for the fastest ramp speed. 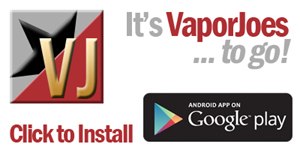 This suite of customization settings allows for precise adjustment of ramp/decline settings and temperature parameters, effectively powering practically all existing Sub-Ohm Tanks, RDAs, and RTAs. Measuring at 85mm by 58mm by 37mm, the CoV Tempest 200W structure features a sharp industrial design of Zinc and Chrome elements, bonded by a carbon fiber panel for a visually striking exterior. The sliding battery door is efficiently engineered for easy mounting of the triple18650 batteries (sold separately), with a traditional three button operation in line with an intuitive OLED screen. Coupling the sophisticated and powerful output performance with timeless style and precision machining, the Council of Vapor Tempest 200W TC Box Mod is set to enter the market in spectacular form.